An AP story written by Bouzza Ben Bouzza, and published by the Guardian on April 27, entitled ‘Jews ease back into Tunisia for famed pilgrimage‘, reports on a three-day Jewish pilgrimage (which took place over the weekend) to the Ghriba synagogue. Ghriba is the oldest synagogue in N. Africa, and traces its origins to Jewish exiles who fled the destruction of the first Temple in 586 BCE. The pilgrimage to the Tunisian island of Djerba – where the ancient synagogue is located – is linked to the Jewish holiday of Lag Ba’Omer, and, in past years, has attracted thousands of Jews from Europe, Israel and the US. The site is rich with legend. The first Jews who arrived were said to have brought a stone from the ancient temple of Jerusalem that was destroyed by the Babylonians. The stone is kept in a grotto at the synagogue. Women and children descend into the grotto to place eggs scrawled with wishful messages on them. The report also provides some proper historical context – such as the deadly Islamist attack on the synagogue in 2002 which significantly deterred Jewish participation in the pilgrimage for several years. At its peak in 2000, about 8,000 Jews came — many from Israel, Italy and France, where they or their forebears had moved over the years. Such crowds haven’t returned since an al-Qaida-linked militant detonated a truck bomb at the synagogue in 2002, killing 21 people, mostly German tourists — and badly jolting the now-tiny Jewish community. The pilgrimage was called off in 2011 in the wake of Tunisia’s revolution, when major street protests ousted longtime President Zine El Abidine Ben Ali, who fled to Saudi Arabia, and some ultra conservative Muslims called Salafis chanted anti-Semitic slogans at their rallies. Last year, the pilgrimage resumed on a tiny scale: Only 100 or so foreigners came. This year, community leaders hope 300 to 500 will have come. However, the report then provides the following highly selective history of Tunisia’s Jews. Jews have been living in Djerba since 500 B.C. The Jewish population has shrunk to 1,500, down from 100,000 in the 1960s. Most left following the 1967 war between Israel and Arab countries, and Socialist economic policies adopted by the government in the late 1960s also drove away many Jewish business owners. First, this truncated history entirely leaves out the oppression of Tunisia’s Jews during the Nazi period. 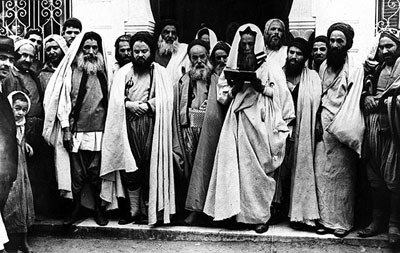 In 1940, as Tunisia was subjected Vichy policy discriminatory, anti-Jewish legislation was implemented. By 1942, the Nazi’s were occupying Tunisia arresting Jewish leaders and sending many Jews to North African Nazi camps. According to Robert Satloff, “From November 1942 to May 1943, the Germans and their local collaborators implemented a forced-labor regime, confiscations of property, hostage-takings, mass extortion, deportations, and executions.” At least 160 Tunisian Jews were deported to European death camps. Moreover, there is much about the roughly 99% decrease in Tunisia’s Jewish population during the latter half of the 20th century that the writer left out. For instance, per JVL, even before the Six Day War antisemitic policies enacted by the Arab government caused many Jews to flee. When Tunisia gained independence in 1956, the new government passed a series of discriminatory anti-Jewish decrees. In 1957, the rabbinical tribunal was abolished and a year later the Jewish community councils were dissolved. The government also destroyed ancient synagogues, cemeteries, and even Tunis’ Jewish quarter for “urban renewal” projects. Additionally, as JVL further explains, it wasn’t Tunisia’s economic policy which drove away Jews but, rather, antisemitic persecution and violence by local Arabs. The increasingly unstable situation caused more than 40,000 Tunisian Jews to immigrate to Israel and at least 7,000 more to France. By 1968, the country’s Jewish population had shrunk to around 10,000. Whilst the Tunisian government may have historically treated their Jewish citizens a bit better than other Arab governments, the antisemitic persecution which largely served as a catalyst for the Jewish exodus certainly mirrors what occurred in the rest of the Middle East – a regional ethnic cleansing of Jews from Arab lands which continues to represent one of the most underreported crimes in recent history. Despite the authorities’ concern to allay the fears of the Jewish community, occasional attacks on Jews and Jewish property have recurred, including the destruction of two synagogues, in 1979 on Djerba and in 1983 in Zaris, near the Libyan border. Why bother the readers with some tiresome facts. I’m waiting for our Pakistani correspondence to tell us how fake this post is and how many Jews still live in pashwar. .. Thanks Bataween. For those unaware, the blog you linked to (‘Point of No Return’) is an indispensable resource on the subject of Jewish refugees. It was despicable the way the Jews were treated in Tunisia. Thank for bringing to our attention.